With nearly 200 staffing and recruitment offices, Tradesmen International will tailor a skilled staffing solution built to deliver skilled craftsmen for short-term, long-term and peak season projects. Fill out the form below and we will immediately assemble a list of our best craftsmen for you. Tradesmen International Will Immediately Assemble a List of Our Best Available Craftsmen Who Meet Your Specific Needs. What trade or trade types are needed for your project? Please enter the number of craftsmen you need at each experience level. 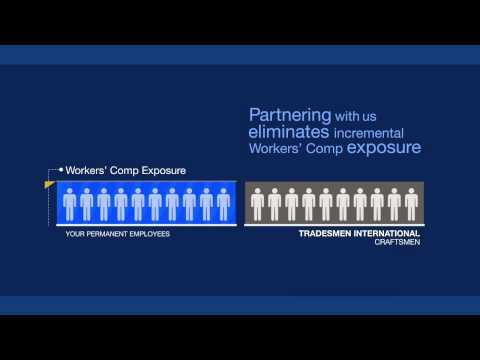 Why you should choose Tradesmen International for your staffing needs. While work has slowed, there are times we still need plumbers for short periods of time to support our core guys... to meet client deadlines. Instead of hiring on guys for short spurts and dealing with recruitment hassles and costs and payroll issues, we're using Tradesmen craftsmen. "While work has slowed, there are times we still need plumbers for short periods of time to support our core guys... to meet client deadlines. Instead of hiring on guys for short spurts and dealing with recruitment hassles and costs and payroll issues, we're using Tradesmen craftsmen." Tradesmen International, LLC. has been instrumental in helping us with filling our labor needs on projects across the country and allowing us to avoid needless hiring costs during the unpredictable economic times. "Tradesmen International, LLC. has been instrumental in helping us with filling our labor needs on projects across the country and allowing us to avoid needless hiring costs during the unpredictable economic times." M&R Constructors has found that Tradesmen is much more than a place to find quality skilled employees. They have eliminated the headaches of recruitment when we need short term employees. "M&R Constructors has found that Tradesmen is much more than a place to find quality skilled employees. They have eliminated the headaches of recruitment when we need short term employees." I partnered with Tradesmen International last year on the largest commercial project ever done by our company. They nearly doubled the size of my electrical crew, enabling me to complete a fast paced project on time and on budget. "I partnered with Tradesmen International last year on the largest commercial project ever done by our company. They nearly doubled the size of my electrical crew, enabling me to complete a fast paced project on time and on budget." Tradesmen International does more than provide top skilled craftsmen. We also help contractors minimize workers’ compensation risks and costs. © 2019 Tradesmen International. All rights reserved.